Should I replace my silver dental filling? This is a common question in our Downey Dental office. Some people advocate the removal of mercury fillings for health reasons. I nor the ADA, CDC, or any other reputable organization recomend the removal of silver fillings for any medical reason unless you have a metal alergy. Very few people have a metal alergy. Some people would like to remove the dark black fillings for cosmetic reasons. In this case if it is patient directed then Doctor can evaluate the situation. This is not a decision that should be taken lightly for there are posible consiquences to a decision. For example a filling could need a crown or a root canal if the filling is large. You are welcome to come in for a complimentary consultation to see if Dr feels there will be negative consequences to a cosmetic decision. 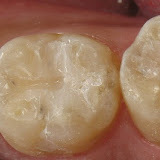 If the reason is due to decay or the filling has broken or chipped then it is advisable to replace the filling.